Strongly stains mitotic cells and can therefore be used in flow cytometric analyses of cell suspensions to detect the mitotic index. Together with a quantitative DNA staining procedure (e.g. 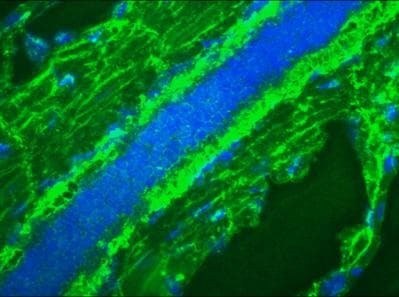 propidium iodide) this antibody clearly distinguishes these M-phase cells from cell at other stages of the cell cycle. Dynamic information can be obtained by combining BrdU incorporation with antibody staining, which can distinguish and quantitate the four major fractions of the cell cycle. This antibody can be used for flow cytometric analyses and immunocytochemistry, it is not suitable for immunoblotting. Total cell lysate of the human bladder carcinoma cell line T24. Our Abpromise guarantee covers the use of ab8956 in the following tested applications. Flow Cyt: 1/50 - 1/100. ICC: Use at an assay dependent concentration. IHC-Fr: Use at an assay dependent concentration. Recommended range is 1:50 - 1:100 for immunocytochemistry with avidin-biotinylated horseradish peroxidase complex (ABC) as detection reagent. This antibody can be used in flow cytometric analyses of cell suspensions to detect the mitotic index. Using immunocytochemistry, a combination of this antibody and BrdU (ab8955) can distinguish and quantitate the four major fractions of the cell cycle. The life cycle of a eukaryotic cell consists of various phases, two of which can easily be identified. Firstly, during mitosis (M-phase), in which the cell divides into two identical daughter cells, chromosome condensation and spindle formation are microscopically visible. Secondly, in S-phase the DNA of a cell is replicated, a process that can be detected using biochemical techniques. In between the M and S phase two gap phases occur: the G1-phase, the gap between mitosis and the start of DNA replication, and G2-phase, the gap between completion of DNA replication and the onset of mitosis. From G1-phase a cell can leave the cell cycle and enter G0, a ‘quiescent’ phase. Regulation of the cell cycle predominantly occurs at three major control points, which govern the transition from G0 to G1, from G1 to S and from G2 to M-phase. Dual parameter flow cytometric analysis of human colon cancer HT29 cells stained with monoclonal antibody 8B3G and propidium iodide (PI). The mitotic cell fraction is encircled. ab8956 staining a membrane-associated compound in proliferating (all) cells in tissue sections of 9 day old Zebrafish embryos by Immunohistochemistry (Frozen sections). Samples ware frozen sections fixed in Acetone:Methanol 1:1. ab8956 used at 1:50 dilution and incubated for 45 minutes at room temperature. Publishing research using ab8956? Please let us know so that we can cite the reference in this datasheet. Thank you very much for your reply and providing this additional information. We appreciate the time that was spent providing this Abreview. The Abreview has now been published and you have received the reward points. The immunogen is stated as being "Total cell lysate of the human bladder carcinoma cell line T24." Are there more specifics regarding this? What specifically is the antibody binding to? Are there any references regarding this clone? The mice that were used to produce ab8956 were indeed immunized with a total cell lysate of proliferating T24. Since the antibody behaves rather poorly in immunoblotting or the amount of its antigen in the cell is low, we have not been able to clearly identify the protein to which ab8956 binds. We have performed flow cytometric analyses with ab8956 that revealed a particularly strong reactivity in mitotic cells (see datasheet}. Unfortunately ab8956 has not yet been published with. Regarding this product, could you please tell me the answer to: What does this antibody detect in the cell? Why is it mitosis specific? Thank you for your patience in awaiting a response. 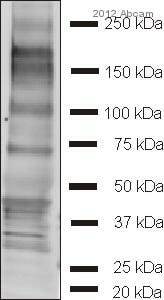 Unfortunately this antibody acts poorly in immunoblotting studies. We therefore have not been able to identify the antigen that the antibody recognizes. Immunofluorescence studies and flow cytometric analyses have show the highest expression of the antigen in mitotic cells. If you have any further questions then please get back in touch with us. 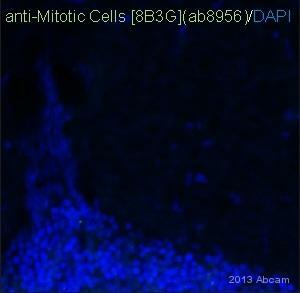 What does this antibody detect in the cell? Why is it mitosis-specific? What is the recommended concentration for staining for FACS? Thank you. Thank you for your enquiry. Although suitable for FACS, due to the amount supplied I have removed this as a tested application from the on line data sheet. If you have any further questions then please do not hesitate to get back in touch with us. I apologise for any inconvenience that this has caused.